Roof for the Main bathroom/shower Bldg. We finished up putting the 1X4 and 1X6s on the roof today. Mike Purcell is donating some roofing and also helping us install it, so George and I have been trying to get as much ready ahead of time as possible. 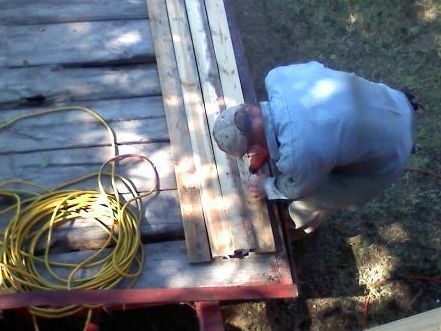 George pre-drilled the screw holes in 100+ boards for the roof.